If you are interested in learning about the hand Delaware played in the Civil War, we have three, history rich, and family friendly attractions to add to your itinerary. First, we recommend grabbing the ferry out to Pea Patch Island, located just off the coast of Delaware City in the middle of the Delaware River, to explore Fort Delaware. Next, you can travel just a few miles north along scenic Route 9 to visit Historic New Castle, Delaware, a Colonial town second only to Williamsburg, VA in the number of authentic Colonial structures. 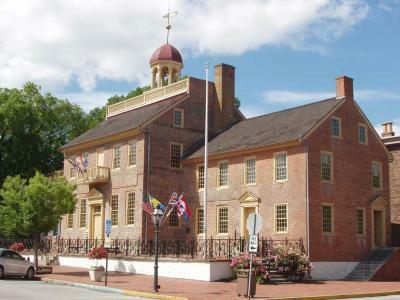 Here you can walk the cobblestone streets, see where William Penn first came ashore in the New World, and learn about the Underground Railroad at the New Castle Courthouse Museum. Finally, the Delaware Civil War story isn’t complete without a stop at Hagley Museum. 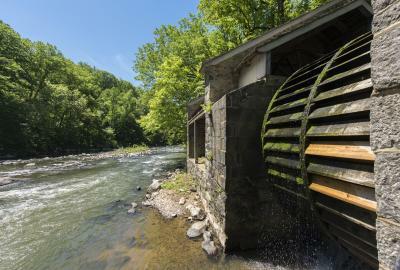 Hagley is home to the original DuPont Company black powder mills – the same powder used by Union Soldiers in the Civil War. 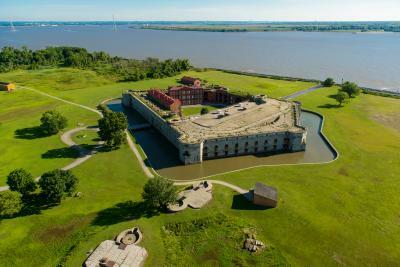 Fort Delaware, also known as the Union Fortress, dates back to 1859 and once housed Confederate prisoners of war. Originally designed to protect the ports of Wilmington, Delaware and Philadelphia, Pennsylvania, the fort is a half-mile ferry ride to the center of the Delaware River from the docks at Delaware City. To this day, Fort Delaware is still living and breathing thanks to a host of costumed volunteers that keep things running just as they would have been back in the summer of 1864. Visitors can get hands on instruction with the blacksmith’s hammer, witness an 8-inch Columbiad gun fire a live gunpowder charge, and find many artifacts from the Island’s past. This famous courthouse, just a bit south of Wilmington, is best known for being the location where Delaware politicians officially voted to break away from both Pennsylvania and England. However, it also played a significant role in the Civil War many years later. New Castle was one of many stops along the Underground Railroad, and not far from freedom across the line in Pennsylvania. Many escaping slaves made their way through here during the Civil War years. Today, visitors can learn the story of Emeline Hawkings and family as they fled to freedom in 1845. The New Castle Courthouse Museum, the site of the 1848 abolitionist trials, also features exhibits on Thomas Garrett, John Hunn and Samuel Burris, who were prosecuted for their role in helping runaway slaves. After firing cannons at Fort Delaware, learn where and how the black powder used to ignite them was made by visiting Hagley Museum. Hagley encompasses 235 acres along the banks of the Brandywine River in Wilmington, Delaware and is the site of the gunpowder works founded by E.I. du Pont in 1802. The grounds include restored mills, a workers’ community, and the ancestral home and gardens of the du Pont family. Much like you will find at Fort Delaware, everything in the powder yard is operating as it would have been throughout the Civil War. You will see demonstrations of a working black powder roll mill, the site of a massive accidental explosion, a sixteen-foot high water wheel, a working steam engine, a Hercules Type A water turbine, and live demonstrations using the black powder that was made in the yard. Working in the powder yard was one of the most dangerous jobs in all of Delaware during the 1800s, but the gunpowder made here accounted for nearly half of all the gunpowder used by the Union soldiers during the Civil War. When you combine the experience of visiting Fort Delaware with the Civil War knowledge available at the New Castle Courthouse Museum and the explosive potential you will find at the Hagley Museum, Wilmington has a deep connection to the Civil War that survives to this day.